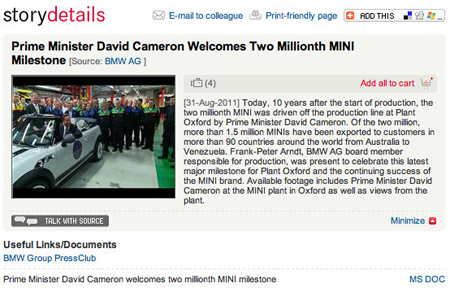 Ten years after the start of production, on 31 August 2011, the two millionth MINI was driven off the production by Prime Minister David Cameron at the BMW MINI Plant Oxford…and working with Mediamark Broadcast we were there to capture the moment and provide footage of this milestone to TV and online broadcasters. The MINI has become a British icon and is one of the few manufacturing success stories in the country with MINI’s being exported to more than 90 countries worldwide. What makes it so popular? It’s unique shape, style and character or it’s global exposure through film?? The broadcast quality footage was sent via satellite link to TV newsrooms and made available to preview and download from the video news source site – thenewsmarket.com.